Home / News / Congrats, TIE Interns! 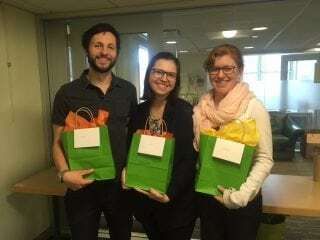 This spring, TIE said farewell to several of its interns! Read more about where the TIE internship can take you! The TIE internship offers mentoring to students interested in pursuing opportunities within the environmental sector, education, communication, and related fields. An integral part of the success of TIE's programs and initiatives, our interns work closely with Jill Parlee, the Assistant Director for Programs and Nitsan Shakked, TIE's Associate Director. At TIE, interns assist with a variety of tasks, including: administration, coordination and management of educational programs, communication and outreach, graphic design, and many other tasks and objectives. The TIE internship helps prepare Tufts students to seek opportunities in their field of specialty or pursue interdisciplinary positions within the environmental sector. This spring, four interns took the skills they honed and developed at TIE to other endeavors. Read on to see where our interns are now! At TIE, Amira assisted primarily with administrative tasks, especially those relating to COP and the SWM Master's program. This summer, she was selected for a Tisch Fellowship and will be working as the Massachusetts Immigrant and Refugee Advocacy Coalition's Summer Organizing Fellow. In this role, Amira will gain proficiency in US immigration history and policy and contribute to the on-going coordination of organizations that serve the immigration movement. LEARN MORE about the Tisch Fellowship program or connect with Amira! Molly assisted with programming during her time at TIE, primarily the Environmental Research Fellowship, Travel Grants, COP, and the SWM Master's program. Molly is a Fletcher School graduate, where she earned her Master of Arts in Law and Diplomacy this spring, concentrating on areas related to Development Economics and International Environment and Resource Policy. Currently, she is pursuing career opportunities focused on sustainability and corporate responsibility within the food and agricultural sector. Connect with Molly! Formerly TIE's communication intern, Carolyn assisted with TIE's social media presence, website upkeep and maintenance, and outreach for the SWM program. This summer, Carolyn is working as a graduate intern for the Office of Energy & Environment at the City of Medford, where she is part of the team working to assess climate change vulnerability and implement and adapt resiliency plans for Medford. READ MORE about Medford's Energy and Environment Office and connect with Carolyn! At TIE, Iain assisted primarily with the coordination of the SWM Master's program. This summer, he was selected for a Tisch Fellowship and will be working at the City of Cambridge as the Sustainability Fellow. In this role, Iain will be supporting the clean energy outreach as Cambridge implements efforts to reduce building emissions by 80% by 2050. LEARN MORE about the Tisch Fellowship program or connect with Iain!